Whether you're looking for something to feed your kids, in need of a great party food, planning snacks for your next game day tailgating party or indulging your craving, this is a great recipe! 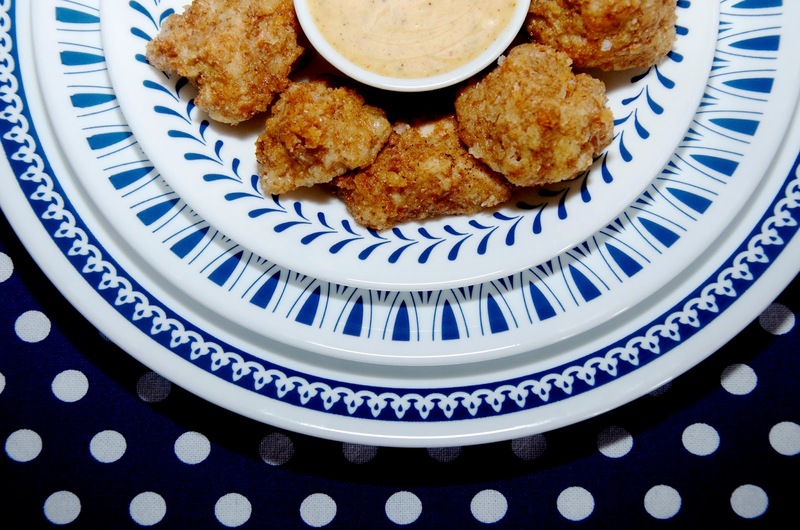 These are chicken nuggets, plain and simple, however if you put them on a platter with toothpicks and cocktail napkins, they're just as suitable for cocktail hour snacking. In case you're scratching your head about the panko bread crumbs, these are Japanese style bread crumbs that are a bit drier and crunchier than other varieties. Panko are easy enough to find in most grocery stores or Asian food stores, however if you can't get your hands on these, I would suggest substituting them with an equal measure of finely crushed crackers or even cornflakes. Additionally, if you're making this for children, I would suggest perhaps reducing the cayenne pepper by half or even eliminating it altogether. You can always mix the sauce together and then add the cayenne pepper at the end to taste. 2. Cut the chicken breasts into 4cm square chunks or thereabouts. There's no need to be super exact about this, but you're looking for pieces about the size of a ping pong ball or maybe just a tiny bit smaller. 3. In a shallow bowl, mix the flour, panko, cumin, coriander, salt and pepper together. Divide this mixture, putting just over half in another shallow bowl. The beaten eggs should be in a third shallow bowl. 4. Get a large baking sheet or cutting board and line it with cling film. Start with a piece of chicken and roll it in the flour mixture in the bowl that has a little less in it. Shake the piece of chicken to remove any excess and then coat it in the egg, again shaking it to let any drips dribble off into the bowl. Finally, roll the chicken piece in the other bowl of flour mixture that has a bit more in it. Set on the lined baking sheet or cutting board. Repeat with each piece of chicken until they're all coated. 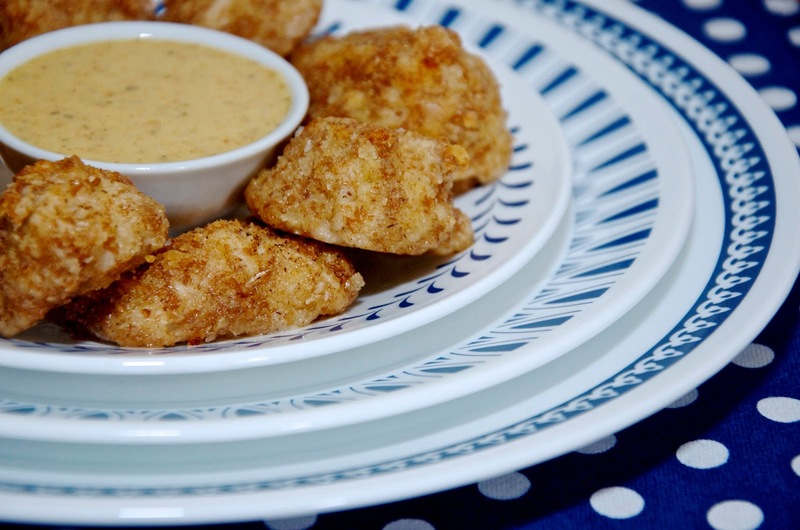 When you're about halfway through, pour the oil into a baking tray with a rim and place it in the oven to heat up while you prep the second half of nuggets. 5. When you've finished coating all the nuggets and the oil has heated up in the baking tray, remove it from the oven. Add the nuggets to the tray, tossing to coat in the hot oil. 6. 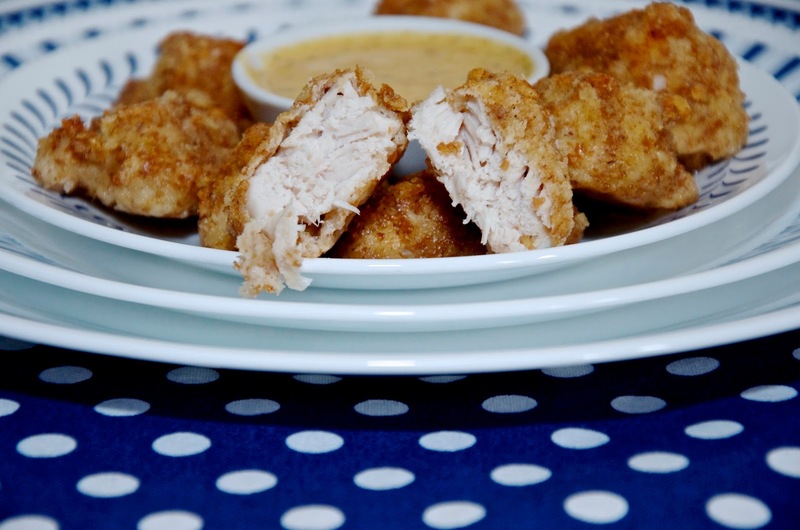 Bake the nuggets in the oven for 25 to 30 minutes or until cooked through, crispy and golden brown. 7. 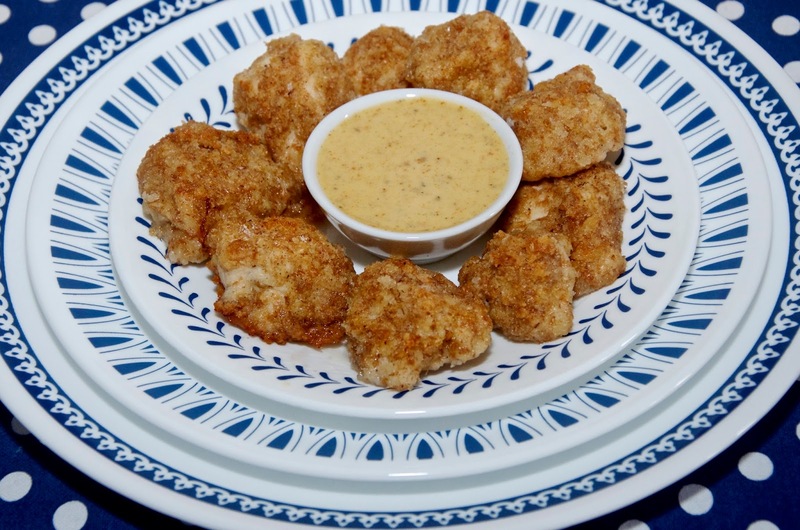 While the nuggets are cooking, you can make the dipping sauce. Put all the ingredients into a medium bowl and stir until completely combined with a wire whisk. Taste and adjust flavorings as you like by adding more seasonings or mustard for a bit more kick, more honey to make it sweeter or more mayonnaise if it's a bit strong for your taste. Feel free to experiment here - my measurements above are simply a guide, but you should flavor this dip to your liking. 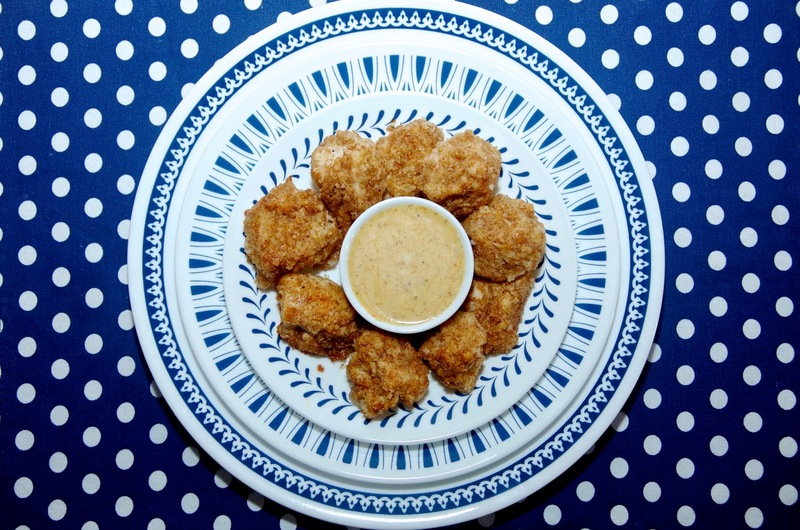 Place in the refrigerator until your ready to serve the nuggets. 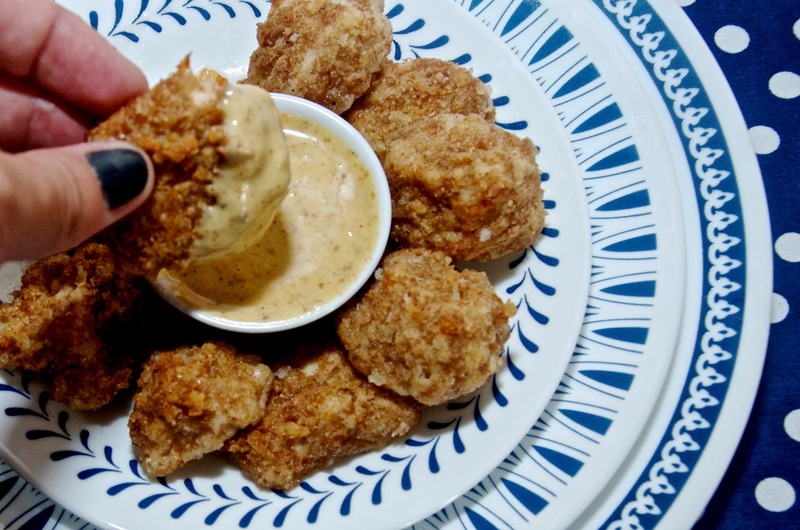 How you enjoy these nuggets is completely up to you. When they come out of the oven, they will be piping hot, so do be cautious and perhaps leave them to sit for 5 minutes before serving if you plan to enjoy them warm. That said, these are just as good at room temperature or cold as they are hot. I have made these before for lunch and served them warm and then found myself finishing the cold leftovers later in the day. They're delicious at any temperature. If you like, you could certainly warm these up in the oven at 220° for about 20 minutes. If you find they're getting too brown, simply cover them with some aluminum foil and continue to heat until they've warmed through. 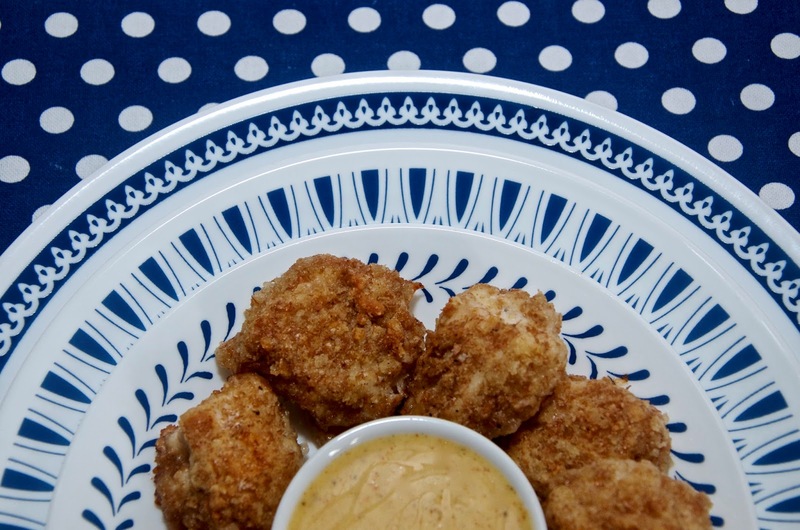 Finally, if you have dipping sauce leftover, pop it in the fridge - this amazing sauce is delicious on so many things from chicken to french fries, so keep it and enjoy! For this recipe post I used some pieces from the Corelle LivingWare Mavi, Sannois & Porto Calle Collections. These beautiful dishes come as sets of 4 place settings that include dinner plates, luncheon plates, bread & butter plates and bowls. At £74.99 for 16 pieces, these dishes are not only very affordable - they're super stylish too! There are so many great patterns and colorways available and I love how all the blue & white patterns can be mixed and matched for more dining options. Chip and break resistant, these dishes are also microwave, dishwasher and oven safe. Even better, the patterns won't wash, wear or scratch off. In short, you'll have these dishes for ages... They're so lightweight and easy to stack, these darling sets are perfect for city dwellers like myself where space comes at a premium. I grew up in the US with Corelle dishes in the house for everyday use and when I graduated from college, one of my first sets of grown-up dishes was by Corelle. It's so great to see this brand here in the UK! For these gorgeous patterns and more, as well as other shapes of diningware, check out www.worldkitchen.co.uk.